I’m lucky I grew up in the Bay Area. Monterey and Santa Cruz were places my family frequented often. As a kid, the Monterey Bay Aquarium was one of my favorite weekend trips. To this day, it is still one of my favorite zoological institutions. Here’s how to spend a day getting lost at this magical place. The Monterey Bay Aquarium is a popular school field trip destination. For solitude, get there right when it opens. You are guaranteed to have the place to yourself. The sea otters at the Monterey Bay Aquarium are the most popular critters here. This exhibit is constantly packed. People wait here for hours (or maybe just me) to catch a glimpse of these furry marine mammals. Sea otters are a keystone species in the Monterey Bay ecosystem. Due to extensive hunting, the southern sea otters on the California Coast are an endgangered species. Some of the sea otters at the Monterey Bay Aquarium participate in the Sea Otter Rehabilitation and Conservation program. This program helps to rehabilitate stranded pups and reintroduce them into the wild to create a healthy and robust population. After the otters, the rocky intertidal zone is my favorite. I absolutely love the Bat Ray touch pools at the Monterey Bay Aquarium. Get up close and personal with bat rays in the touch pool. Stick your hand in the water and hope these majestic creatures glide close enough for a touch. This whole exhibit is really awesome, showcasing how resilient marine life is in the tide pool zone of the ocean. Don’t forget to check out the wave crash! This simulates the experience of being underwater while a wave barrels down overhead. The jellyfish exhibit at the Monterey Bay Aquarium will mesmerize you.. Tanks of these invertebrates showcase how biodiverse they are. I could spend all day watching the jellies floating around in their tanks. Don’t forget to turn your camera flash off! The Open Sea at the Monterey Bay Aquarium is magnificent. This is the largest exhibit that the aquarium has. Designed to mimic life in the open sea, take some time to watch hammerhead sharks, turtles and more swim by you. 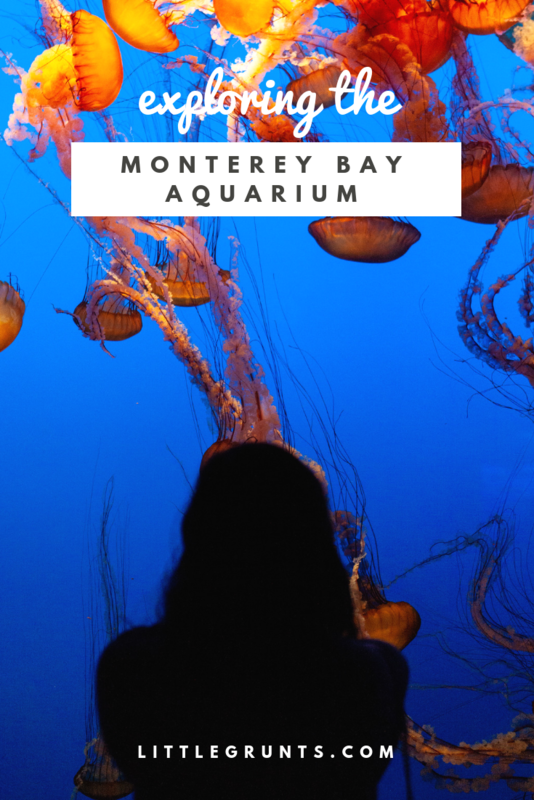 Have you been to the Monterey Bay Aquarium? What are your favorite exhibits here? Looking for more things to do in the area? Here’s how to spend a weekend in Carmel. Or you can go further south to beautiful Big Sur.